Perfect secure hiding place for your valuables like micro sd cards, diamonds or rolled up cash. This devices is an improved version of the old Soviet KGB "dead drop" hollow bolt used during the Cold War. Use to hide cash when on long car trips. It features an O-ring seal for weather-proof storage of small valuables, communications, etc. It has reverse threading on the bolt head for additional security. 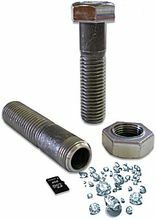 This new version utilizes a 3/4" diameter bolt providing a larger storage area than the original. Its secret storage compartment has a diameter of .49" and a maximum depth of 2.81". Overall length is 3.43". Important: To open, you need to twist the opposite of what you would expect due to its reverse threads.